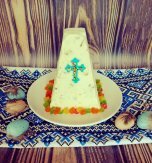 Paska - Easter dessert of pot cheese mixed with sugar, butter and raisins. You will definitely like the delicate, aromatic mass with raisins. Take out the sour cream, curds, and dairy butter from the fridge beforehand. They should have the room temperature. Pour sour cream in the blender and add dairy butter. Beat up the ingredients. Add curds and whip everything one more time. Then pour condensed milk in the blender, finely rubbed lemon rind (1 tsp approximately) and 1 tbsp of lemon juice. Whisk the ingredients until the mass gets the homogeneous color. Taste the dish and add the sugar if necessary. Wash dried fruit and cut them finely (or cut the candied fruit). Put them into the blender and stir the mass with the spoon carefully. Cover the cake basin for baking with thick cloth. Roll up the paska with the cloth. Cover the basin with a saucer and place some load above ( a pot with water). 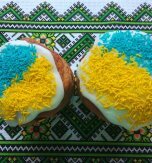 Place the paska in a fridge for twenty-four hours. 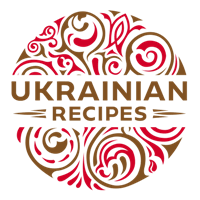 Overturn the cooked paska on a plate. 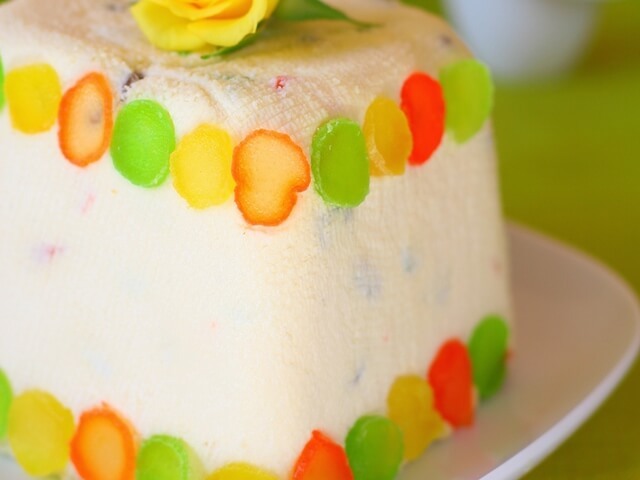 Take off the cloth and decorate paska with fruits. Tip! 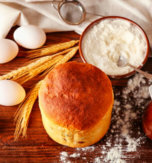 Use a warm knife to cut paska. You should dip it in hot water, wipe with napkin and only then cut. Make this procedure before each cutset. 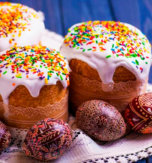 Serve paska when it is cooled.